Mother. Grandmother. Still fine as hell. When looking back at past eras, the 1950s is looked upon by many as an idyllic time in American history. The nuclear family headed by a male breadwinner was the desired norm and televisions shows such as Father Knows Best and I Love Lucy were popular. However, there was a dark side to this lifestyle. Women were treated like second-class citizens and some were living unhappily married because their financial and educational options were limited and they were as dependent on their husbands as their children. The media, in collusion with the government, and sociologists constantly espoused the virtues of family and children and women, who wanted more out of life were looked upon as freaks of nature. However, some women during that era expressed dissatisfaction with their lives and an inarticulated longing for a life beyond their children and husbands. Some of these women were forced out the workforce after World War II and felt resentment that their only option for financial stability was marriage. This inarticulated longing would lead to a major social upheaval towards the end of the 1950s and would be the beginning of the second-wave feminist movement. This movement caused a shift in family values and altered family structure for future generations to come. 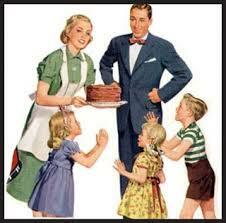 The 1950s Family Experiment would be short-lived but fondly remembered. Several factors lead to the forming of the nuclear family. By the end of the 1940s, the divorce rate dropped sharply; the ages of people getting married fell to a 100-year low; and the birth rate soared. Women dropped out of the workforce as soon as they become pregnant and some young women had two or more children in diapers at once. Also during this time, the education gap between young middle-class men and women increased and job segregation for working women and men peaked. Limited educational and job opportunities for women made them more dependent on marriage for their financial well-being. Young, newly married couples were encouraged to sever their family ties and put all their emotional and financial eggs in the small basket of the immediate nuclear family. Women were told by experts that all their energies should be used for their husbands and children, not aging parents and other relatives. Psychiatrist Edward Strecker and various colleagues argued American boys were infantilized and emasculated by women who were old-fashioned “moms” instead of modern “mothers”. Modern mothers placed their parents in nursing homes; old-fashioned mothers took their parents in at the expense of their own “important” nuclear family. A modern mother was not supposed to have friends, a job, or anything or anyone that would take attention from her husband and children. She was also supposed to grant early independence to her male child. It is no wonder that many women who believed in this advice and put it into practice ending up abusing alcohol or tranquilizers over the course of the decade. Women were encouraged to confine themselves to a very narrow definition of “true” womanhood by a variety of sources such as family education specialists and marriage counselors, columns in women’s magazines, government pamphlets, and above all television. These experts told women during the 1950s that their greatest role on the planet was to be wives and mothers. The role of a “real” woman was to have no interest in a higher education or a career and women were taught by these experts to pity women who had the nerve to want a life beyond being a wife and mother. Televisions shows such as Donna Reed, Ozzie and Harriet, Leave It to Beaver, and Father Knows Best showed women how much easier their lives would be if their families were like those families and the I Love Lucy show warned women about the perils of what happened to a woman who wanted a career or if she schemed behind her husband’s back (Coontz, 38), The mothers on Leave It to Beaver and Ozzie and Harriet were immaculately dressed with pearls around their necks. Their homes were clean and their children never got into trouble. However, on I Love Lucy, Lucy usually looked terrible by the end of the episode. Her hair was at times standing on top of her head and her clothes filthy from her weekly adventure. Women and their families watched these shows and tried their best to emulate the perfect and bright lives shown to them on a weekly basis. Noticeably absent from these discussions are the role of Black women during this era. Black women were delegated to the background as housekeepers and nannies, taking care of other women’s children and then going home to take care of their families. So from the beginning, this image of a beautiful, bountiful lady of leisure that keeps her home, children, and herself immaculate was never intended for Black women because Black women never had and were not given those same opportunities. They had to work. But unlike white women, they received help from their extended family. Grandparents, aunts, uncles and other family member assisted in the raising of children. Many parents left their children with family members when they made the trek to the North during the Great Migration and when they got on their feet, sent for their children and the family members who helped them. However, towards the end of the 1950s, a dramatic shift occurred. Cultural values changed dramatically and the children of these women found the social hypocrisy of their parents sickening. Many young adults and some of their mothers would march in the streets to protest against sexism, racism, and militarism. Minorities and women began to receive the civil rights that were rightfully due to them and more and more women entered the workforce, forcing a dynamic shift in child rearing practices. By the 1970s, husbands and wives had begun to share household duties and women were no longer bound to their homes. The concept of family has changed and although there have been some issues; it was ultimately for the best. Women have more rights but divorce is commonplace in current modern society and many children live in one-parent households. Despite the gains of the 1960s, women still face discrimination and do the majority of household work regardless of how many hours they work per week or if they have a partner. But women now have opportunities that would not have been imagined sixty-years ago. Children do not have to see their mothers treated like chattel and America is on the verge of electing the female President of the United States. Nothing remains the same – ever. 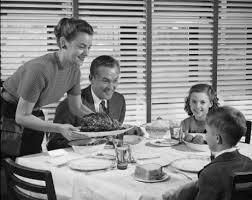 The constantly changing landscape of the American family owes a lot to the women of the 1950s. → Keepers of Blackness Powers Deactivate!